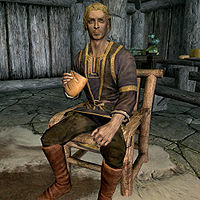 Delacourt is a Breton rogue and the resident bard of Falkreath. He spends his entire day at Dead Man's Drink, either entertaining the customers or sitting for a meal. For a small fee he can sing Ragnar the Red or Age of Aggression. He wears a set of merchant clothes and a pair of boots. He is equipped with an iron dagger, and carries a selection of common items and gold. He may cheerfully tell you, "Keep in song in your heart to ward off the gloom." or "Perhaps one day, I'll write a song about you!" This page was last modified on 10 May 2015, at 07:46.